Obituary – Groom, Lois Ann (Wilson) « Perry High School Alumni Association, Inc. Band Queen Attendant 48-49, Red Hots 48-51, Cheerleader 49-51, Student Council 50-51, D. E. 50-51, Office Staff 47-49, Girls Sextet 49-50, Mixed Chorus 49-50, Courtesy Guide 48-50, Junior Girls Trio 49-50. Mrs. Lois Ann Groom, 49, 8 South Seventh street, died at approximately 9:30 p.m. Thursday after she had been found lying alongside a city street near Seventh and Market streets. A fire department ambulance took Mrs. Groom to Perry Memorial hospital at 9 p.m. She died a short time later. Funeral will be at 10 a.m. Monday at the Parker chapel. Burial will be at Grace Hill cemetery under direction of the Parker Funeral home. Police Chief Mike Wolfe said Friday an investigation was underway into the death. He said he wants to locate the person who first found Mrs. Groom lying along-side the street. Officers are proceeding on the theory the death is not connected with a crime. The former Lois Ann Wilson, Mrs. Groom was born in Perry Nov. 18, 1932. 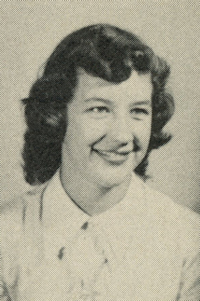 She graduated from Perry high school in 1951 and attended Oklahoma State university. She was married in 1951 to Donald Rupp and was married in 1976 to Lynn Groom. She had worked as a beauty operator and a bookkeeper. Survivors include her husband, Lynn Groom; two daughters, Mrs. Garwin (Deborah) DeRoin, and Mrs. Dennis (Dee) Briegge, both of Perry; a son, Mark Rupp, Perry; her mother, Mrs. Mary George, Kingston, Okla.; three sisters, Mrs. Gerald (Maxine) Minor, Oklahoma City; Mrs. Susan Flynn, Plano, Texas; and Mrs. Everett (Betty) Majors, Tulsa; two brothers, Kenneth Wilson, Oklahoma City, and David Wilson, Albuquerque, N.M.; and two grandchildren.